Verizon FiOS is offering “Custom TV” -- another effort by traditional TV providers to move toward “a la carte” selling of TV channels, all in the wake of growing “cord-cutting” worries. Verizon will sell a smaller package of channels under Custom TV -- around 35 -- much smaller than the approximately 150 to 300 that traditional TV providers offer -- for as low as $55 a month. Customers for Custom TV get a base of broadcast channels, as well as CNN, HGTV, AMC, Food Network, plus two kinds of “Channel Packs” -- different categories of channels -- kids, lifestyle, news and info, sports, pop culture, and entertainment. Customers can add on more group of channels for $10 each. Dish Network Sling TV, an Internet-based stand-alone TV service, offers a $20-a-month package for a slim number of TV channels, although no broadcast channels. Customers can add on groups of channels for $10 per month; as well as HBO for $15 a month. Other traditional pay TV providers like cable operators, have also offered stripped-down packages of channels. Media analysts are concerned about growing cord-cutting of traditional pay TV services. In addition, new separate stand-alone Internet-based TV services -- so-called over-the-top (OTT) services -- continue to come online. This includes Sony’s PlayStation Vue, CBS All Access, HBO Now, Nickelodeon’s Noggin, WWE Network, all of which have already launched. One each from Apple and NBC (for comedy content) are also planned. 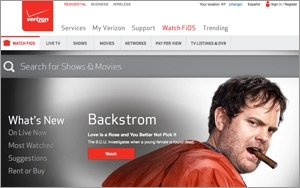 Verizon FiOS has just under 6 million video subscribers. The Wall Street Journal first broke the story of Verizon’s Custom TV plan.